The current Guinness World Record for most number of hugs given by an individual in an hour is 2,436. This was achieved in India in 2012. 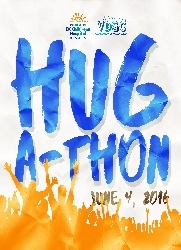 Our event aims to beat this record by giving 3,000 hugs! A hug is a way an individual expresses care for another. A hug is incredibly valuable, so in addition to attempting to break the record, we want to monetize the value of a hug by fundraising for the BC Children’s Hospital. We will be hosting two ‘Hug Clinics’ in advance of event day so that we are prepared for the big day – we only get one shot to break the record! Hug Clinics will be held on May 14, 2016 (Saturday) and May 28, 2016 (Saturday) from 5:30 pm – 8:00 pm. We encourage all participants to attend!